Ukraine has been called an ethnic borderland, and is just that. A young country, Ukraine’s history during the Second World War is as fascinating as it is confusing and muddled. With approximately 1.4 million Ukrainians killed by the hands of the Nazis and their own Ukrainian neighbors, war memory in Ukraine is tainted, diverse, and very much alive in the country today. Because of the high death toll in Ukraine, as well as the high amounts of collaboration, the country is now littered with protected monuments that are held in high esteem to those wishing to honor those who were killed in Ukraine during Nazi occupation. Photographs of such atrocities make events of the past undeniable, and often times indict people for their collaboration with the Nazis. Other photographs make viewers unable to forget the image that they saw. Yet some locations of mass executions in Ukraine have very little documentation at all, and certainly do not have photographic evidence available (at least to the public). The viewing of a photo can raise an emotional response within the viewer, perhaps even more so than verbal or written testimony. Therefore, this paper aims to address the impact of photography on Ukrainian memory of the holocaust in Ukraine, as well as to address how the lack of photographic evidence of an event or a group can impact memory. The controversial memory of war heroes, collaborators, and victims, is difficult to navigate. One question posed by Elizabeth Jelin is “who has what rights to determine what should be remembered and how?”[i] These are questions that will be addressed in this paper. The memory of locations and of people is determined by those alive today, and is constantly in flux. Photographic evidence lends itself to the answering of these questions by preventing an erasure of Ukrainian history during the war, but what happens when there is a complete lack of evidence? Or the evidence can be viewed in multiple ways (as will be addressed below in the case of Stepan Bandera). Ukrainian history has been erased in the past, but the ability to view photographs as evidentiary support for past events may prevent such an erasure from taking occurring again. “I will never forget the day that Nazi troops chose, for some reason to ride through the village of Kortiless. The Ukrainian people cheered them…”[viii] The Nazi invasion of Soviet Ukraine began on June 22, 1941. By mid-September of the same year, Red Army forces were surrounded, and by the end of September, the Nazis had taken control of Ukraine.The knowledge of oppression under the Soviets is necessary to understand the state of Ukraine upon the Nazi invasion, and to why Ukrainians were likely to welcome the Nazi’s, particularly in the West, an area that was not as “russified”. Many saw the war as an opportunity to gain independence from Russia. This historical knowledge impacts war memory in Ukraine into the modern day, and may impact the erection of monuments to protect the nationalist sentiment that aided in the massacre of Ukrainians during the war. 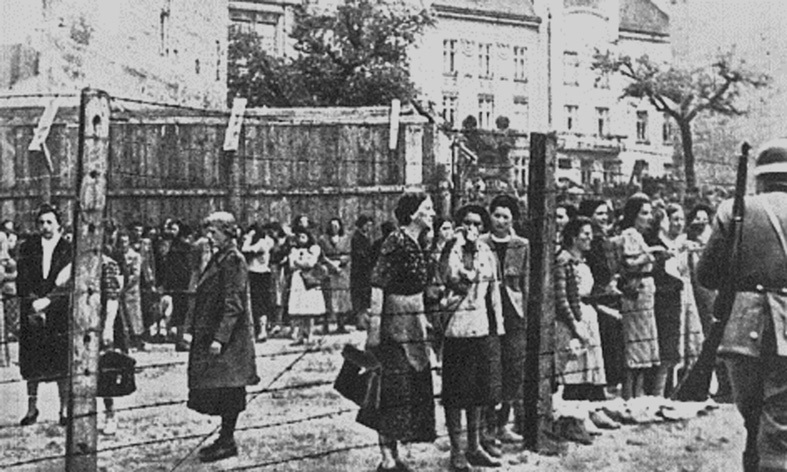 Upon the outbreak of war, Ukrainians were unaware of the racial hierarchy of Nazi ideology, by which the majority of Ukrainians were deemed unfit, but ranked slightly above those facing immediate destruction (Jews, Gypsies, and other “Asiatics”) meaning that only few were seen to posses the racial qualities that would allow them to be “Germanized”. [ix] This may also have contributed to willingness to collaborate with the Nazi invaders, and to a guilt that may tarnish the war memory of Ukrainians, especially in the heavily nationalist Western Ukraine. Ukrainian participation in the massacre of Jews and other Ukrainians makes the memory of victims and of their massacre difficult in Ukraine because the memory indicts the perpetrators, who were often collaborators. The “Hero of Ukraine” is a Ukrainian national honor established in 1998 to honor those deemed to have taken part in either acts of heroism, or achievement in labor. Lately, one historical figure has tarnished the honor, causing Ukrainian protest, public petition, and court rulings to overturn the awarding of this honor to a controversial “hero.” Stepan Bandera, former Ukrainian Nationalist and accused Nazi collaborator during the Second World War, was awarded the title in 2004 by Ukrainian president Victor Yushchenko. However the scandalous award is not only causing issue in Ukraine, but around the world. The European Parliament has called on Ukraine’s new president, Victor Yanukovich, to strip Bandera of the title, saying that the European Parliament “deeply deplores” the decision because of Bandera’s leadership of the Organization of Ukrainian Nationalists (OUN) who collaborated with Nazis during the war. [x] The issue of whether or not to strip Bandera of the “hero” title divided the country in January 2010. During this time a court ruling declared that Bandera was not fit to carry the title and the title was stripped January 1st was the 100th anniversary of the birth of Stepan Bandera, and one reporter in Ukraine noted that: “Suddenly, just as Lenin’s statues had peppered the Soviet Union, statues of Bandera started appearing all over west Ukraine. 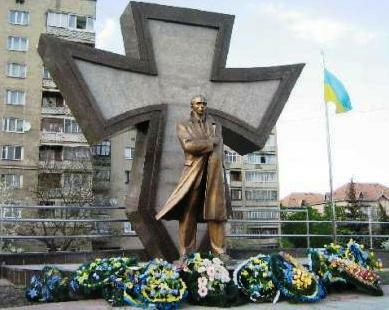 If Yanukovych dishonours the memory of Bandera, there is likely to be a new epidemic of statues in the west, while those in the centre and east could be vandalized.”[xi] One such monument is pictured below, and is located in the Western Ukrainian town of Ivanovo-Frankivsk, others like it can be seen in L’viv, and Ternopil, as well as other Western Ukrainian towns. More recently, as of October 2011, Russia has denounced the Ukrainian honor again, as the renaming of a street from “Peace Street” to the “Nachtigall Battalion Warriors Street” has caused a similar situation to the awarding of the national hero title to Bandera. The Nachtigall Battalion Warriors Street was made to “honor members of the auxiliary formation that fought alongside the Nazis in World War II.”[xiii] The Nachtigall battalion was established by the German military, and was staffed with members of the OUN. [xiv] After learning of the name change, Aleksander Lukashevich spokesperson for the Russian Foreign Minister said, “The actions of the Ukrainian authorities cause surprise and outrage. Do not they see the sacrilege in such actions? 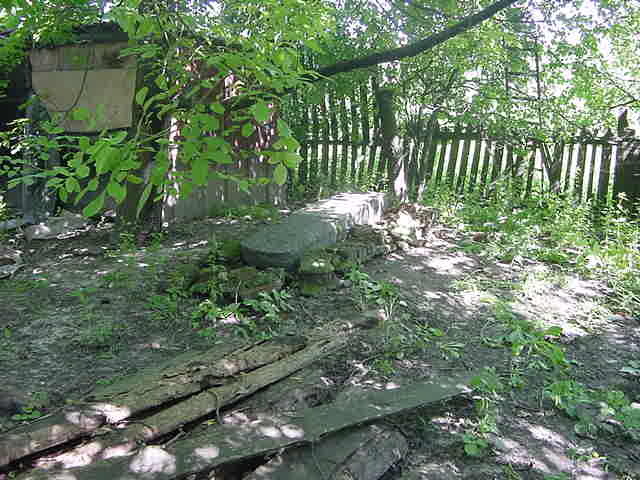 We still count upon the local and central authorities in Ukraine to hold a thorough investigation and return the street its noble peaceful name.”[xv] The history of the Organization of Ukrainian Nationalists and their militant branch the Ukrainian Insurgent Army is one that continues to divide Ukraine because of their work alongside the Nazi occupiers during World War II. Photographs taken during the war in Ukraine can be helpful for historical purposes, but also can be damning for those photographed. Pictured below is a photograph taken of the Nachtigall Battalion Ukraine, who actively collaborated under Stepan Bandera with the Nazis prior to Operation Barbarossa. 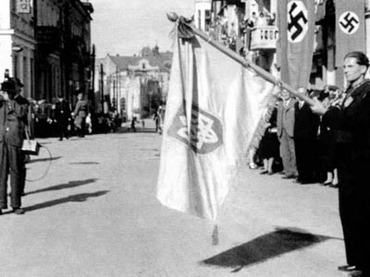 Photographs of Ukrainian nationalists actively participating alongside the Nazis’ are undeniable, and the link from Stepan Bandera to the Nazis is undeniable as well, therefore, these historical images are able to bring to light a history that verbal testimony (which can easily falter or be rebutted) cannot do. They place the people in scenes that they cannot deny being in. However, many deny that the work of men like Stepan Bandera should be considered collaborationist, because as Ukrainians, they were also victims to the war, and to the previous communist regime. Therefore, conflicting memory results in a torn Ukraine. Can the perpetrators (in this case, nationalists) also be the victims? The murder of the peoples of L’viv is undeniable and is documented through photography. There are numerous photos on any search engine that allow a viewer to see bodies strewn across streets or stacked into piles, victims in the ghettos witnessing hangings and mass execution, people being dragged through the streets by soldiers…the list of atrocities in photographs continues. This makes the history undeniable. The proof is in black and white, staring the viewer in the face. 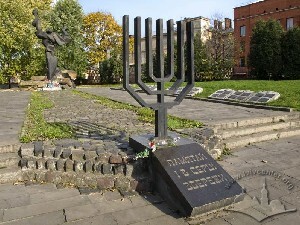 The city of L’viv, which had a long standing a rich Jewish culture was practically erased of its Jewry during the war. However, the city also boasts nationalist sentiments to this day. Within the city, there are countless sites commemorating nationalist “heroes” such as Stepan Bandera, as well as sites commemorating those killed by both Nazis and collaborators. This area is not recognized or protected as a monument or landmark, but is maintained by private property owners. Sudilkov is interesting because while there is a monument erected in Shepetovka, there is nothing recognized to commemorate those nearly 500 people who were unable to walk to Shepetovka, and were therefore shot or buried alive. The story of Sudlikov stands out because there are undoubtedly so many places like it that have been forgotten, or are left without recognition. War memory in Ukraine has often been determined by the government, however, within the past couple decades, there has been an outcry from the peoples of Ukraine and many Jewish organizations (as well as the international community) to view the history from the perspective of those who were killed, the victims. The memory of the holocaust in Ukraine will continue to change and evolve over time, as distance from the past changes how it is remembered, as new research uncovers more facts, and as history is manipulated by those who benefit from such exploitation. The histories of massacre in Ukraine are well documented, and are especially revered in the Eastern half of the country, where the nationalist movement was not as widespread during the war than in the west, which identified more with western ideologies than the eastern and Russian ideologies of the Eastern Ukraine. 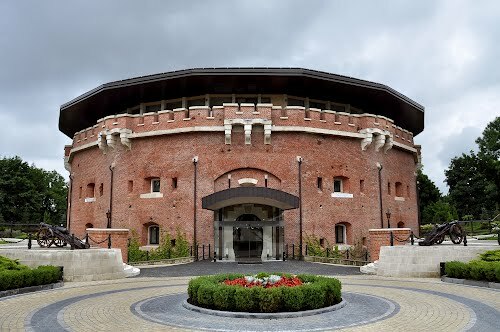 Western Ukraine, however, did experience remarkable atrocities, which are remembered through various landmarks and monuments throughout the small region. The largest massacres and those which now have erected monuments are well known and have piles of photographs of the atrocities that took place at the site(s). This may lend to the impact of the event, the ability to visibly witness the massacres, this therefore leads to more recognition of the events, and a more public and recognized need for monuments and memorials. But what of places like Sudilkov? Places where mass graves and those who lay in them seem forgotten? Unable to locate any photographs of the events at Sudilkov, one must wonder if the lack of imagery from the event lessens the impact of the memory. Many in Ukraine do fight for the memory of those killed, however, Meylakh Sheykhet, one of Lviv’s last Jews, who stated: ““It is hard to imagine these sites being treated less respectfully,” he says. “Over the tombstones of some of history’s greatest rabbis, there are now movie theatres, discos and car parks.”[xxviii] War memory in Ukraine has often been determined by the government, however, within the past couple decades, there has been an outcry from the peoples of Ukraine and many Jewish organizations (as well as the international community) to view the history from the perspective of those who were killed, the victims. The memory of the holocaust in Ukraine will continue to change and evolve over time, as distance from the past changes how it is remembered, as new research uncovers more facts, and as history is manipulated by those who benefit from such exploitation. [i] Jones, Adam. “Memory, Foregetting, and Denial.” In Genocide: a comprehensive introduction. 2nd edition ed. London: Routledge, 2006. 502. [ii] Paul Kubicek, The History of Ukraine (Connecticut: Greenwood Press 2008), 7-8. [viii] Laizer Blitt, No strength to forget: survival in the Ukraine, 1941-1944 (London: Vallentine Mitchell), 33. [ix] Wendy Lower, Nazi Empire-Building and the Holocaust in Ukraine (North Carolina: The University of North Carolina Press), 27. [xiv] Serhy Yekelchyk, Ukraine: Birth of a Modern Nation (New York: Oxford University Press, 2007), 141. [xxi] Bartov, Omer. “Travels in the Borderland.” In Erased: vanishing traces of Jewish Galicia in present-day Ukraine. Princeton: Princeton University Press, 2007. 29. [xxiv] Browning, Christopher R. Ordinary men: Reserve Police Battalion 101 and the final solution in Poland. New York: HarperCollins, 1992.